You don't know what you've got 'til it's gone - and screens in the windows is one of those normal aspects of housing in America that you don't necessarily find in Europe. Most homes have no screens on their windows. They can be purchased, but most of the time you or someone else needs to custom-build for your window needs. Since we knew we had a temporary lease in this house, I decided that I'm too cheap to spend the time and money, but there have been a few instances I really wish that we had them. It would keep the cats in. I can't prove it definitively because I didn't see it happen, but I am 99.99% sure that one of the cats jumped out of a window on the first floor (that's the second story for the North Americans) into the garden below. Tweedle-Dum (meaning Sebastian) has a tendency to perform amazing, yet extremely stupid and rather graceless acrobatic feats to get into high places or get outside. During this particular episode, I had left some bedding to air out in Little Man's window and went about my business. A little while later I heard a crash of some child-sized chairs falling over, then saw the cat outside. The backdoor was still locked and the downstairs windows shut, so leaping out the window seems the only likely scenario, though I had previously thought (and hoped) he wasn't dumb enough to try it. At least he didn't break himself in the process. 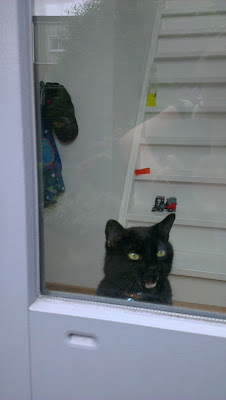 wouldn't let him out as I left the house later that day. It would keep Little Man in, or out. Occasionally, we have to remind the Little Man that while the cats may do it, it's not okay for people to crawl through the kitchen window when the backdoor is closed. It would keep the critters out. One night last fall while Mark was out of town, I found a monster-sized spider I on the blinds in our bedroom just after finishing the bedtime routine with Little Man. I'm not exactly a huge fan of spiders to begin with, and I think this was the "big one" I've been worried about. I couldn't smack it without bending the blinds and/or missing and losing it and spending a sleepless night waiting for it to crawl over my face. Instead, I spent 15 minutes performing some sort of extended swatting action with a thick pamphlet, vigorously "encouraging" the spider to go out the wide-open window. About 2 minutes into the performance, Little Man came bounding out of bed and into the room to provide questions and commentary that didn't exactly calm my mania. (What's his name? His name is Charlie? He's REALLY big. Spiders lay eggs? Is Charlie a mama? Wow, that was a silly thing to do! - and when Charlie finally acquiesced to my repeated requests to rocket out the window - FLY, CHARLIE, FLY!!!!) This guy wasn't the first to crawl through the window, and he sure won't be the last, but I really just try not to think about it. it would be easier to just forget about it and move on. For now, we just close the windows when we're gone. That being said, there are two situations that come to mind that I don't mind having screens. The first is if a child locks themselves in, and you out. This happened once during a playdate, but since the window was open, I just climbed in and unlocked the door from the inside. The other situation is any time we want to use the kitchen window like a McDonald's drive through - usually while we're grilling. These are all fine and good for a once-in-a-while-need, but I think I'd still prefer the screens. Have you been surprised by a "normal" thing from your homeland that just isn't a thing in your new country? Oh, I totally get this! For our one bedroom window that opens, we fortunately have blinds that I can let down, but open to allow the air to pass through, while keeping the cats from wandering out. I'm so glad they don't try to squeeze through. Downstairs, we have a couple of transom windows that are our only windows that open. (Seriously, we have so many large windows, but almost none that open.) To stop all the flies and bugs from getting in, I bought some pretty mesh fabric to create "screens" that I tacked up over the transom windows. And we finally bought a screen door last year so we could open the back door without the cats getting out (and going over the wall) and to stop the bugs getting in. I just wish we'd gotten the screen door sooner! I hate not having screens like this is a very serious issue I have and spend way more time than I should obsessing about it! When I am home alone I sadly will just not open anything as my fear is bees and wasps! Oh man, I JUST had this conversation with an American in Norway last weekend! It's SO annoying not to have screens. Our apartment is on the 8th floor and so we just CAN'T leave our windows open because of our stupid cats. We can only open them with these little hooks on so that they don't go more than an inch or so. It's such a bummer. We don't even have the kind that can tip in or something slight, so there's just no option. If/when we get our own place someday, we'll definitely make the investment for at least a few real screens to be put in. It's good yours don't squeeze through - mine are not so bright or patient, and will then jump the fence if they get out (quite the feat since neither has front claws). I like the idea of the mesh fabric, though. I'll have to keep that in mind for the next place! Hahaha! I'm more worried about the jumbo-spiders than the mozzies - I'm a wimp and I don't have a problem admitting it! And my cats really are not smart enough to stay in on their own - they'd be a real danger to themselves if they met up with one of the neighborhood cats. Haha! Have you thought about a mesh fabric over the windows like Alison mentioned? I'm thinking that's a really good idea for the next place. Isn't it stupid that even that high up you need to worry about a cat doing something "brilliant"? I have a 3-finger width that I use to open our windows. It's just small enough that they can't poke their heads through. Now the question is - how hot will it get in the summer? Oh yeah, that's where we're lucky at least. The hottest day last year was in the high 70s. Of course, it's possible it could get worse, but unlikely to last at least. I have no idea how people more south of here do it! Ugh YES! Last summer in Germany I spent the better part of my day killing the flies and wasps that ambled into our apartment through screen less windows. But we couldn't close them, otherwise the house turned into an oven. When we moved into our apartment in Georgia, the first thing my husband said was, "Look how many screens we have!!" We were on the first (American second) floor when living in France, and with big inviting windowsills I was in constant fear of the boys climbing up and falling out. Not that a screen would completely prevent that, but the open egress is so tempting! Mosquitos were a big pain too - luckily they weren't so bad in the city. Sometimes I close the curtains but then it blocks all the light since they are meant to be blackout ones! Hahaha! When they're up for it, the cats will get the flies, but even they won't go after the bees. I bet you were so excited to throw open the windows the first few times! Oh, I definitely worry about someone hanging out the windows. I think the screen makes a psychological barrier to make the window less tempting. Hopefully the next isn't filled with those windows. And living in the roof you NEED the windows open in the summer (especially last summer!). Oh, I LOVE your screens. It's such a good idea! And I don't blame you for being paranoid. At least the last time that Sebastian jumped the fence he actually came back over when I called him and patted the top of the fence - but there's no guarantee that it will work next time. Those screens are so helpful aren't they?! I'm certainly without them our cats would have gone chasing after the birds they see out on the lawn in front of the windows! I love them being on the doors too, not sure how I lived without them growing up the in the UK. US certainly has it right with having them!